SHE DIDN'T! 💇🏻 Ombre Hair? SO. Yeah. 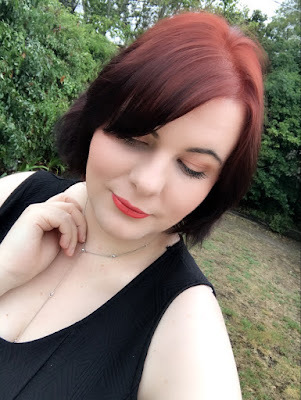 I took on another hair adventure .... not pixie ..... not purple hair .... not black hair .... and thank goodness no longer "50 shades of brown" hair (ugh. wasn't me!) NO ladies and gentleman, I have ombre red hair! Yep Bright Red to Deep Maroon! Something different and less damage to my hair, than say if I would have gone with the Ariel hair that I was planning too. But this however is interesting and not a look that everyone has which is fine by me. I did post a quick video about it. I am a professional trained freelance Makeup Artist, and now Beauty Youtuber. NEW DRUGSTORE MAKEUP || MAYBELLINE HOT OR NOT? VALENTINE'S DAY 💝 GLOW & GLITTER!